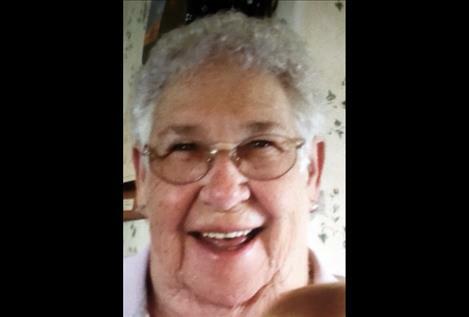 POLSON — Faye E. Peterson, 86, passed away Tuesday, July 17, surrounded by her loving family at her home in Polson. Faye was born to Frank and Bertha White in Polson on Nov. 20, 1931. She attended school in Plains. In 1946 Faye married Donald McMullin in Plains. They moved to Superior where they raised their family. Her husband Donald lost his life in a logging accident in 1974. That same year Faye proudly earned her G.E.D. diploma. Faye moved to Polson where she worked as a waitress at the Good Ship Lollipop restaurant and later served as the manager at the Copper Shop. Finally, she retired after working several years at the Plum Creek Lumber Company Nursery. On Aug. 20, 1983, she married Bill Peterson in Coeur d’ Alene, Idaho. Faye enjoyed fishing anywhere, especially on Flathead Lake. She also enjoyed traveling with Bill to many places including trips to Alaska. Faye took pride in being a marvelous homemaker. Faye was preceded in death by her parents; her first husband, Donald McMullin; her daughter, Marsha McMullin; her brother, Bob White; her granddaughter, Shauna McMullin and her stepfather, Red Siler. Survivors include her husband, Bill Peterson of Polson; her brother, Jim White of Polson; her daughters, Donna McMullin of South Fork, Colorado, Mary McMullin (Harold) of Yakutat, Alaska; her son, Larry McMullin (Lanita) of Spokane, Washington; her step-daughter, Valerie Olandini of Carlsbad, California; her sister-in-law, Dallas Peterson; her step-son, Anthony Peterson; her nephew, Michael Peterson, and her step-brother, Ken Siler (Agnes), all of Polson. She is also survived by many grandchildren, great-grandchildren, and great great-grandchildren. Per Faye’s wishes, no services will be held. Cremation has taken place under the direction of the Lake Funeral Home.